Yesterday, I attended what was perhaps the most special circumcision ceremony (brit milah) I have ever attended in my life (including those of my own three sons). I never saw the baby, never got a chance to wish the parents “mazel tov.” I never even entered the room in which this ceremony took place. Instead, I went, as planned, to stand outside in a huge crowd of people, hopefully to listen, and then leave. Nothing mattered other than to provide the parents and family of the newly named Ari Yosef Salomon, the opportunity to look out the window of the synagogue and see just a fraction of the people who were sending their love and prayers on this momentous celebration of life. I arrived early (I have always hated being late) and got almost to the entrance door, where we were politely told that only close friends and family would be allowed inside. No surprise there. My goal was to find a shady place to stand, and I was blessed to have gotten there early enough to not only have shade, but even be very close to the large monitors the family had set up for the crowds outside. With the microphone inside broadcasting to the crowd, we were able to see and hear all that would happen inside. It is a custom to have a festive meal after a brit milah. How do you afford feeding hundreds of people (financially, emotionally) when only days before, three members of your family have been butchered? When this was always supposed to be a family celebration and yet outside there are hundreds and hundreds of people who have come to show their love, to sent their support, to celebrate with you at the point in your life when celebrating is the last thing you can imagine doing? The answer was that the family, amazingly thoughtful, had about 10 tables set up outside where we were and after the ceremony, in addition to the constant bottles and cups of cold water being sent around to the crowd standing in the sweltering heat, they provided cake and blintzes and more – for everyone. When I arrived, the tables were being covered with pretty blue tablecloths – likely the same ones being used inside for a family meal. And then, as police patrolled the distant perimeter, as people were slowly beginning to arrive, and gather outside, one man did the unthinkable. In anger and hate, in righteous indignation, he walked to the tables and to the shock of everyone, began upturning the tables, knocking them down…the pretty blue tablecloths falling to the ground below. I stood for a moment in shock and then as others started yelling and moving towards the man, I realized that there was little more that I could do. I don’t know why but I thought of my camera. I thought it would embarrass the man, maybe stop him and so I raised my phone and began to take pictures. It was the only thing I could think of to do to capture this outrage. The man belongs to the Vishnitz synagogue in which the brit was being held. The same Vishnitz movement to which many of my much loved and respected relatives belong. They would never do such a thing but in their name, this man chose to desecrate and attack. Why the family decided to hold it there, I do no idea. Nor can I comprehend what could go through the mind of this man, to attack a family celebrating what should have been a joyous celebration – but was already tinged with such sadness because the birth of the baby was followed, just one day later, with the murder of his grandfather, uncle, and aunt. And then this man comes to attack the celebration? What insanity! What insensitivity! What intolerance. The man was quickly escorted away by the police. He was put in their car. I was hoping they would arrest him, but after some time, they let him go. The man didn’t even have the dignity to leave in disgrace. Rather, he walked back towards the tables, this time, however, he simply went into the synagogue (or maybe it is a school as well, since there were many children. And before you say that this is one man, clearly light in the brain, more likely mentally ill, allow me to explain why this is not about one man, but a culture. Not one individual, misguided and perhaps even evil but many – including dozens of children and their teachers. What kind of education are they giving these children? What failed attempts at parenting did we witness as dozens of boys jeered the crowd and even worse, failed to fulfill the mitzvah of answering “amen” to the blessings being said at the ceremony? Before I go on, I want to state clearly that I do not believe, I cannot bear to believe that this is the entire Haredi world, not even all of Elad, certainly not even all Vishnitz Haredim. I have relatives who are Vishnitz who would never act this way. 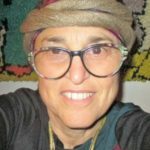 They are tolerant and loving people who would have stood next to me and cried as the baby was named Ari Yosef…Yosef for his murdered grandfather. But this man was not alone. He was supported, right and left and even from above. Quite literally. From the right, there was a school filled with dozens and dozens of boys. I would not have expected them to interfere and try to stop this man bent on hatred, but I would not have expected the jeering of the crowd, the sneering and the seeds of hatred that their parents and teachers have already apparently implanted in them. They had no shame in what was done and felt no inclination to fix the damage caused. Others rushed to quickly right the tables and restore order. But for this article, which hopefully the family will never see, they do not need to know what was done in the moments before they opened what was supposed to be a joyous event to all of “Am Yisrael”. 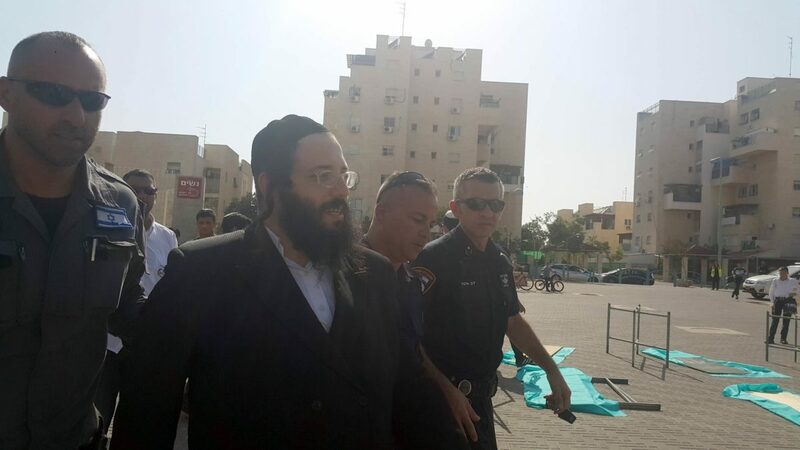 From the left, there was a synagogue – from which someone yelled, “what right to you have to put tables up there?” That is what bothered this second Haredi man? 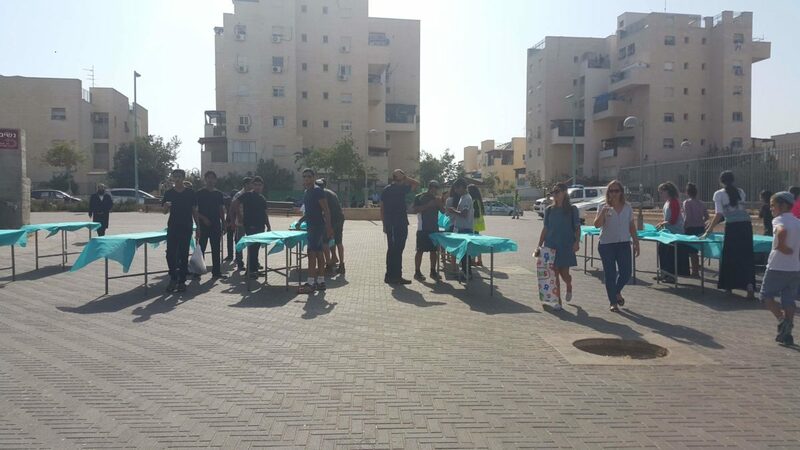 Not that the first had done what he did, but that a family in mourning wanted to thank hundreds of people who came by offering them some refreshments and a chance to say a bracha, a blessing, in honor of their new child? And from above, not Above, but from the large balcony overlooking where we all stood below, the minute the brit began, the crowd of boys and teachers started shouting. They only stopped when the people below looked at them with such anger, when I and others began taking pictures and videos of them. From the moment I understood that they were there to gawk and disturb rather than show supposed for the family as we were doing, I was sick to my stomach, even sicker perhaps than in those moments when I watched this deranged man knock over the tables. Above me stood many young boys and their teachers…and I thought again of the education these children were receiving this day. They watched us as if we were animals in the zoo, when that was, too often, what I thought of them. Superior and smug looks on their faces as they clearly believe they were fulfilling God’s will when in fact they were desecrating it…there above the synagogue where below a righteous family had worked beyond human endurance to find joy and celebrate life, even as they fulfilled the laws of mourning. Several people next to me waited for them to throw something at us or to spit down on us. Each time they made noise, I pointed my camera at them and watched as the teachers pulled out of sight. It reminded me of a Polish man who screamed out “Hitler friend” in Poland. There too, I took out my camera and watched as he quickly ran behind a building. Coward, I thought then…cowards, I thought yesterday. I can’t tell you whether the boys refrained from spitting on us out of some slight recognition that we too were Jews, that they feared the police arresting them or their teachers, or were simply too busy being entertained by the thousands of people who stood below. But the moment that sickness turned to anger came at the end of the “joyous” ceremony inside…in most ceremonies such as this, everyone would begin congratulating the parents and grandparents, singing and celebrating. Those who had not heard the name would ask and listen to stories about how the name was chosen. Here, everyone had heard the name because it was said over a microphone so that those outside could hear. Everyone know that Ari Yosef would carry the name of his murdered father, Yosef, all the days of his life (may he be blessed and live to 120 knowing only happiness, health, and love). Instead of the great post-ceremony noise, there was suddenly silence inside as the father of the newborn baby began reciting the mourner’s kaddish for his father, his brother, and his sister, who were murdered just one day after his child was born. Outside hundreds of people responded with “Amen” – hundreds, even thousands, but not the boys above us, not the teachers tasked with educating them to be righteous Jews. For some reason, my eyes never left the crowd above as I watched in shock and fury. Not a single “amen”. My two year old grandson will answer “amen” when he hears others say the word; my almost-four year old granddaughter and her six year old cousin automatically respond when someone says a blessing. But these boys, all of them at least 8 or 9 years of age and probably closer to 11 or 12…not a single “amen” from them. Two months ago, I wrote the above…and then stopped. Too sickened by what I had experienced, too angry. I stopped because I didn’t have a way to end it. What was my point? Would something I write change the education these children were failing to be given, convince this evil man to repent? Today, I will finish it…please read it here: Why Ultra-Orthodox Jews Should be Drafted. There’s definitely something perversely non-Jewish in their values and behavior. It is not genuine Judaism for sure. What a horror.